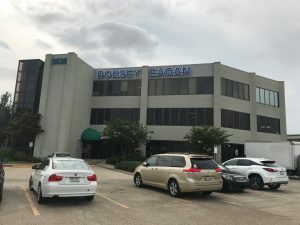 After 14 years, Dorsey Development is relocating from its historic French Quarter New Orleans location to a new corporate headquarters in the suburb of Metairie, Louisiana. Dorsey’s recent acquisition of the former Midland Plaza Office Building located at 3636 N. Causeway Blvd, Metairie, Louisiana 70002, is the future location of Dorsey’s new HQs. The 3-story glass office building has great views of Lake Pontchartrain and is conveniently located close to Interstate 10 and the foot of the Lake Pontchartrain Causeway. The new corporate office was necessitated by Dorsey’s continued growth – both in new developments and in new personnel. Dorsey has expanded its Dollar General Territory to new states. Dorsey has also begun a QSR Franchise Development Program, which now includes development for El Pollo Loco and Burger King. The renovation of the Dorsey space will be complete in the summer of 2018.